La Barbie Juarez (l) in the ring against a tough Melissa McMorrow as they battled for the WBC Female Superflyweight International Title, February 22, 2014. Up this week … two women’s boxing title bouts! Fernanda Alegre (18-1-1, 9-KOs) vs. Marisol Reyes (13-8-1, 6-KOs), WBO Female Light Welterweight Title held at the Club Atlético Huracán, Necochea, Buenos Aires, Argentina, on February 21, 2014. Okay so it was a truly hot night. The culmination of the heat wave that has left New York City sweltering and gasping with the kind of air that is so hard to breathe the only way to deal with it is to dodge in and out of air-conditioned stores as so many leapfrogged pit stops for crisp cool breaths. 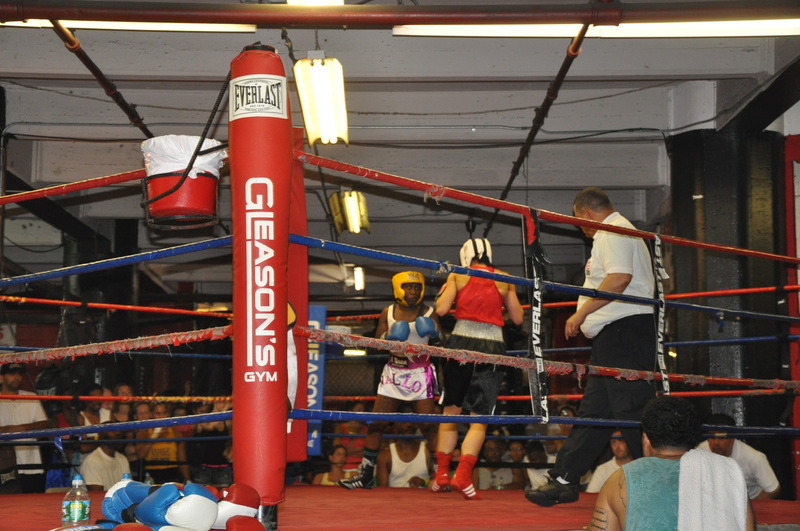 None of that seemed to matter though to the crowd at Gleason’s Gym who’d come out to support their friends, family and gym pals competing at the second weekend of the New York State Amateur championships. Heading over there to cheer on my fellow Gleason’s gym rats, I was grateful for the breezes moving bits of that heavy NYC summer air through the streets of Dumbo. I was looking forward to the chaos that is a fight night at the gym with fighters and their trainers, crowds and officials, milling around in the run up to the bouts–all in the pre-air conditioned splendor that is a boxing gym with its windows wide open, while the ceiling fans and industrial sized floor fans moved warm humid air from point to point intermingled with the faint hint of hot dog smell and sweat. This to me is boxing at its purest: a club show with none of the attendant hoopla of a pro-fight, and where the motivation comes from a love of the sport and the possibility of a trophy at the end. Arriving there, snagging seats for my husband and I, waiting out the hour or so before the fights actually started was an opportunity to watch a world in motion. Friends embraced, young junior olympics kids nonchalantly hung near their families before being beckoned by coaches and trainers, and the novice and open fighters circled about. Having already made their weigh-ins, fighters, some nervously, were calculating just how much longer they’d have to wait before they fought. “I’m not sure where I’m supposed to go now,” one fighter said. In this interregnum, I hung for a few minutes with my trainer Lennox Blackmoore who had three young fighters, ran into my fellow Women’s Boxing Symposium pal Sarah Deming who was there with her Cops n’ Kids fighters (one of whom I saw win later) and otherwise sat with a silly smile on my face as I watched the scenes unfold–admittedly in between gulps of water. At some point, the crowd getting thicker and thicker, and the action at the gloves table heating up, pro-fighter and Gleason’s denizen Sonya Lamonakis took on her duties as ringmaster of the two rings of boxing. Tinkering with the a mic covered in gaffer’s tape, she finally managed to get the equipment working and began making announcements that reverberated with a tinny echo over the heads of the crowd. With two rings going and 15 or so fights in each, the sound, difficult enough to hear, was still something for the fighters and their trainers to key into. They had to wait for their call to the glove table two or three fights before they were due in the ring, and then their second call to get ready for their fight. Seated right behind Sonya, I had a perfect view of both rings and of the fighters as they had their wrapped hands inspected by the officials before handing over their red USA Boxing Metro books and being gloved-up by their trainer: this done once the proceedings started as the fighting raged in both rings. Sitting there, I was not so much aware of the individual fighters (though I had friends I cheered on), as the ebb and flow of boxers as they readied, plied the canvas with everything they had, and then in turn alighted as winners or losers. The crowd too had an ebb and flow. Each of us covered in sweat, focused on one or both of the rings, with syncopated cheers and whistles, claps and exhortations coming as one or another pas de deux engaged in some new ferocity of purpose won the attention of the spectators. 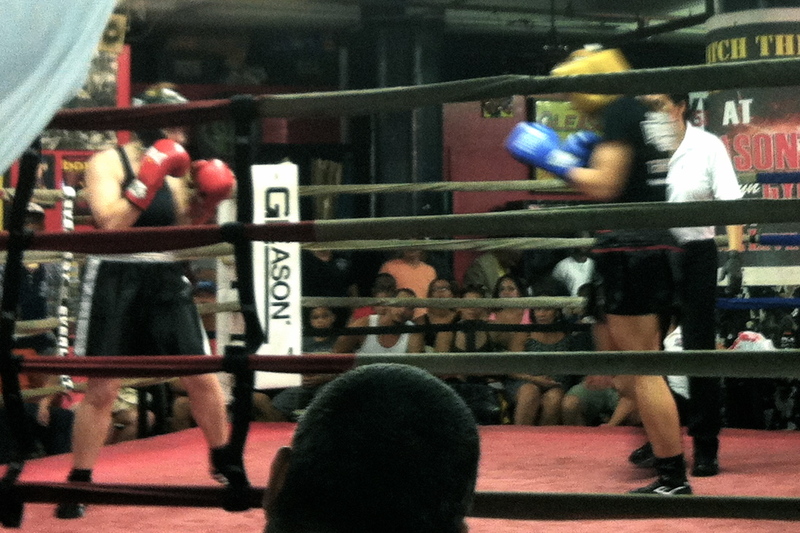 My friend Michal Perlstein was up in the sixth fight. 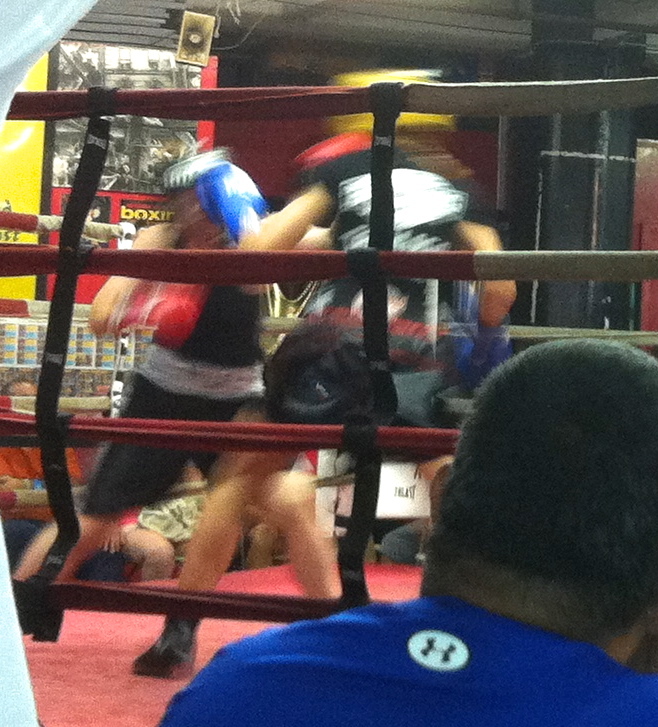 This was to be her third amateur fight. Having made her weigh-in with ounces to spare she was elated at the prospect of getting into the ring. Her ring hopes, however, were somewhat dashed by the prospect of fighting others in her 152-lb weight class. Two were former national champions, and one woman, a Polish fighter, was said to have had over 200 amateur fights in Poland, although she claimed she’d only had 3. We all figured the 3 were “here,” with no mention of “there,” with nary a word on her purported MMA experience. Still, she was game and had a set purpose in her face as she stood outside ring number 1 near the red corner waiting to be called. Indeed she had drawn the Polish ringer in the blue corner, who stood in a shiny black gladiator skirt with all of the confidence of a seasoned pro, her legs, perfectly formed and massive–the kind that can support an onslaught of body shots a la Mike Tyson. Called into the ring, they fought cleanly and hard, but within thirty seconds it was obvious that Michal was outclassed and by a minute in she was unable to really defend herself. The ref wisely called an eight-count after she sustained a series of head shots and her corner consisting of two great pro-trainers Delon “Blimp” Parsely and Don Saxby had seen enough and called it off. And that is the thing about the amateurs too. It’s not about suffering devastating losses in the ring, but the sport itself and the chance to hone skills and learn the craft and science of the game (although after I left, Sonya told me one of the women fighting in the semifinals for the 141 pound weight class allegedly bit her opponent in the third round and was disqualified, Lennox though was not so certain that it actually happened). Knowing Michal, she’ll be back at it today or tomorrow. She’s that kind of competitor, one who is truly motivated by her love of boxing. So many others of the fighters who alighted into the ring last night, including USA National Boxing Champion and Golden Gloves champion Christina Cruz (who won her 125 pound semifinal match) gave everything they had as well, and will no doubt feel the same way whether they won their fights or tasted disappointment. They’ll be in the gym as soon as they are able to pick up the gloves again with all of the attendant pride, humility and fortitude that it implies. Christy Martin and the decision: Is a hand worth more than an eye? 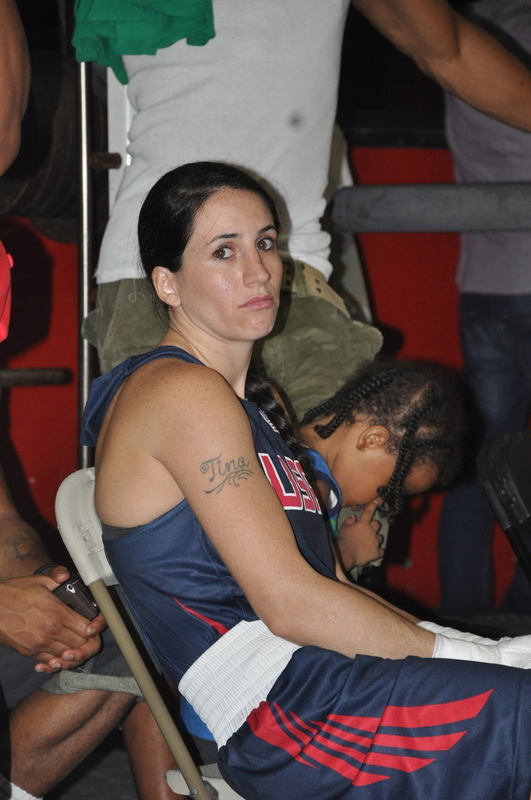 As has been widely report, in a 5-0 decision by the California State Athletic Commission, Christy Martin lost her bid to overturn her June 4th loss to Dakota Stone. Over at Boxing Insider.com, Jackie Kallen took another tack in her piece entitled, Should we have instant replay in Boxing? Her take was to ask if the way around questionable calls is to add instant replay — especially since the issues in the moment may be more readily understood. She also opined that Christy’s choice of *power* attorney, Gloria Allred may have annoyed the Commission enough to turn Christy down for that reason alone. Kallen’s other point was to talk about the general issue of bad calls and how they tend to even out. What I was wondering is whether a broken hand is worth more than say a broken eye? So let’s talk about another fight, the Pawel “Raging bull” Wolak vs. Delvin Rodriguez back on July 15th a mere 6 weeks after Christy’s 50th fight as a pro. Wolak v. Rodriguez was the fight that had everyone watching Friday Night Fights going wild — including the commentators. In fact, the fight was sooooo hot, FNF suspended commercials from the seventh round on. 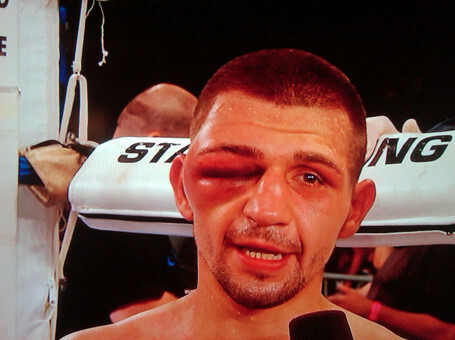 This is what Pawel Wolak looked like in the 9th round! That eye started getting big in the seventh round, and he kept fighting with it THROUGH THE END OF THE FIGHT! And if you watched the fight you could see that it HURT, but he told the Referee Steve Smoger and the doctors he was good to go … and they let him fight on! Not only that, but the commentators ALL agreed that the fight SHOULD CONTINUE AND THAT THE REFEREE WAS MAKING THE RIGHT DECISION IN LETTING IT GO ON! Christy broke her hand in the fourth round and kept on fighting even rocking Dakota in the fifth. It reminded me of boxing gym tales about the guy who won fighting with nothing but lefts ’cause he broke his hand — and was the reason my old trainer Johnny Grinage used to make me do at least one round of lefts on the heavy bag every time I trained. All I can say is that Christy was living that old saw. As she went on to fight in the sixth round she had NO intention of quitting and only winced after throwing a huge right. 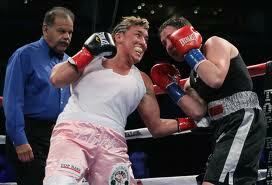 As she shook off her obvious discomfort Referee David Mendoza called the fight. When it came to pain, however, it seemed as if the real pain on her face was when Mendoza stopped the fight! Yep, she broke her hand, but stopping the fight with one minute left to go in the bout wasn’t going to do *anything* to help her hand — it was already broken. What it did do was deny Martin and Stone the opportunity for a real close to their fight. 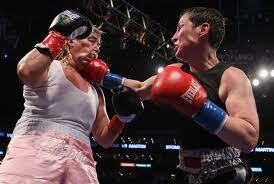 A lot of things could have happened in that fight and the Ref owed it to Martin to let her finish it out. Let’s face it, the Martin v. Stone fight was a war — not unlike the Wolak v. Rodriguez fight. I’m all for stopping fights when it is obvious that a fighter is being badly beaten and damaged — or is no longer able to defend themselves. Was this the case here? In my estimation no because we’re talking Christy Martin, as brilliant a phoenix as has every graced the boxing ring. Christy, a dedicated professional deserved the benefit of the doubt, much as Pawel Wolak was given the benefit of the doubt by Steve Smoger — and Dakota Stone deserved the opportunity to win or lose unhindered by what seemed like a very unfair decision by the Referee. I don’t know that I’d go so far as to say that the call was strictly based on gender — but it sure wasn’t boxing. 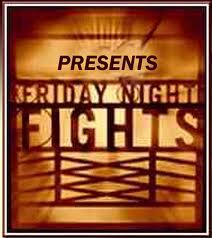 Friday Night Fights – of our own! Friday Night Fights — of our own! Okay … so when was the last time Friday Night Fights had a women’s bout??? Hmm. Not in the mood for the non-stop “pithy” banter of Teddy and friends? I say … how about some Friday Night Fights of our own! Well here goes … with special, special thanks to the diehards out there that take the time to post these remarkable women’s bouts on YouTube!